Every year when I have my check up, they make my appointment for the next year. Well, it was going to fall on the Tuesday of the week I start my new job. Aint gonna happen. So I called & told them I was going to have to reschedule it for a few months out. They said, "Can you come tomorrow" - when I was on vacation - PERFECT TIMING! ... so glad I got it in because when I was there, I found out my OB/GYN - the same doctor I've had for 25 years (what's the deal with 25 years lately?) is retiring. Her last day is the end of this year. I would have been devastated to miss her before she left. Bruno is now on a special prescription dog food & we ran out. Well, I actually ordered a bag & it came in .... except it was ADULT. Bruno & his little old man teeth - or lack of I should say - cant chew it. & the vet was out of the small breed kind. So I went to order on Chewy's & placed the order around noon.... & do you know it was at my door the next morning at 9am!!!!!! I haven't been so happy in my whole life!!!!! 794 / Christmas Tree up!!! ... enough said. I just am not feeling it this year. I never even got my Fall stuff out - & I didnt even put up ALL my Christmas decoration. I am happy with what I got up though. I'm not sure its for the best that she was sent home... but I know she was thankful to be in her own bed & in her own home. While we thought mom was still going to be in the hospital on Thanksgiving having her tests done (dont ask ....) I had a few of my Joysters reach out to me & ask if we needed to come to their house for Thanksgiving. How generous is that?!?!? It touched my heart so much for the offer of spending a holiday with their family. So glad to spend it with my brother & his family. I always say that I live for the holidays ONLY for my brother's broccoli casserole. THE BEST!!! 799 / First Waffle House experience. I've always wanted to try it out & it finally happened. & I dont know if it was because we shopped off all the Thanksgiving calories or what, but it just tasted so good. It really has become a tradition for Ricky & I to shop the day away. I have heard from so many that they cant imagine their husband doing that with them. Ricky is all about a deal & Black Friday is like HIS Christmas day. It makes him so happy to find some bargains everywhere you go. I almost dont want to even say this because every time I do, he takes a turn & it gets bad again.... but he got a new antibiotic SHOT this last time... & I have been told to give him a bath every TWO days now. I dont know if its a combo of both, but his skin is better than ever... (Please Lord, let it continue)... its been so good to see him not gnawing his legs off or rubbing across the carpet all night long. He's not too thrilled about the every other day bath thing though. We got this set when Family Christian went out of business a few months back. I've always wanted the Willow Tree Nativity. This was all they had left - they didnt have the actual manager scene that they set on. I didnt care - we still had to have it. We had been looking for a nativity that it would fit in or something that would look nice. Couldnt find anything. So I found this sign at Hobby Lobby & thought it would make a great back drop. I put the block underneath to give Mary & Joseph some height & I think it turned out wonderfully. I am still planning on painting the block gold to match the star... but I really do think it came together well. 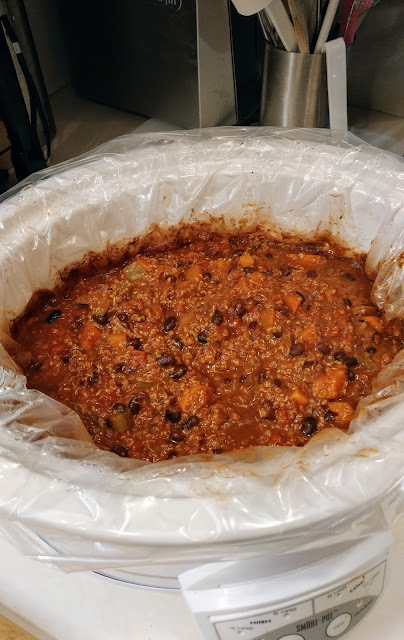 mmmm.... Ricky has been craving my quinoa, sweet potato, black bean chili - it was great for left overs the first few days on my new job too! 808 / All the encouragement!!! I cant even begin to tell you the amazing encouragement from so many incredible people on my first day. Sweet prayers lifted, precious words said to me, amazing messages of uplifting comfort - from all over. I honestly couldnt have felt better going into day 1. 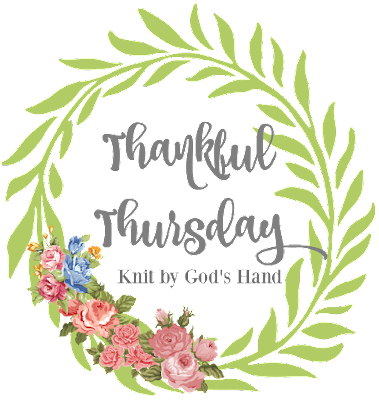 One of my friends even said she prayed for a good nights sleep for me - soooo needed - & I got it & I told her I know it was because of her thoughtful prayer for me. Haha my dad is the same way about Black Friday shopping, I can't believe he likes it so much! I usually don't put all my Christmas stuff out each year and I even put my "little" trees up but this year I put our big tree up and went all out! We are hosting a Christmas party this year so I thought, why not? Glad your momma and Bruno are both doing better and that the past few days at your job went well. What a pretty nativity set! I love the backdrop - good choice. You've probably shared it before so I'll look for it, but just in case could you share the recipe for the chili? I hope your mom is doing better and is able to get back to her normal routine (and no hospitals). My husband would never venture out with me on Black Friday ;) Lucky girl! I'm so so so happy Bruno's skin is doing a little better! And yay for quick dog food delivery! Your nativity looks great! I love nativity scenes. I have a similar painting behind one of mine! You've had a super tough year, Rebecca Jo! Take Christmas as easy as you want to. It can be tough, especially since right now we tend to look back on the year and culminate all those emotions on top of the holiday ones we're experiencing. No shame in have a chill Christmas! Our Chewy order is always slightly delayed because we live in the middle of nowhere. But it is PRICELESS to not have to drive to the store and haul home a bag of dog food. Mike is the same way about deals whereas I'd much rather stay at home being lazy and avoiding crowds! 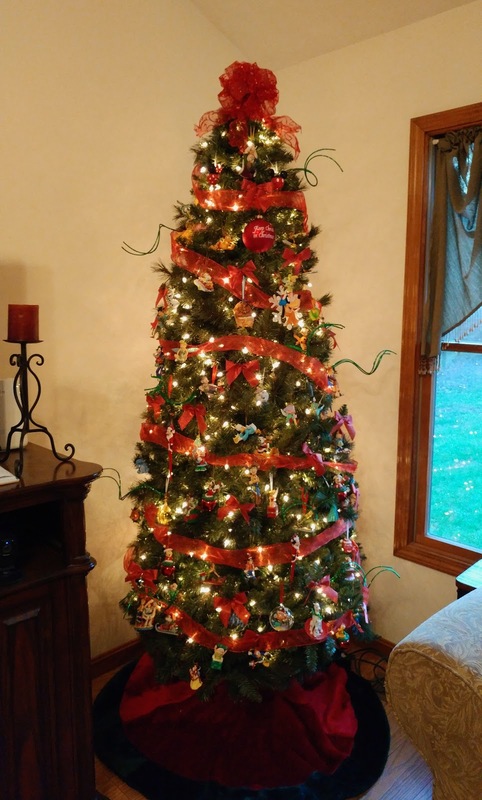 Your tree looks so pretty! I usually don't feel much in the Christmas spirit, but I'm trying this year. Glad to hear Bruno is doing better and your mom is home! 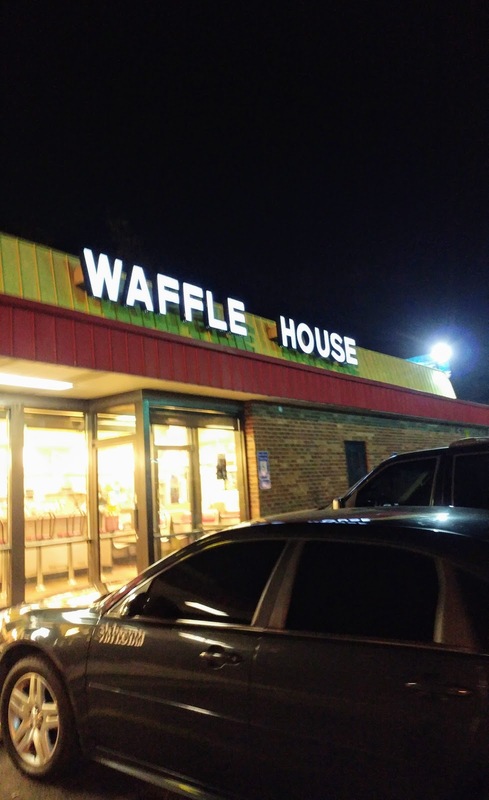 I haven't eaten at a Waffle House in years, but it sounds really good right now!! I can't seem to catch the Christmas spirit this year, either. Wayne got our tree down last weekend but it's not decorated. I'm seriously contemplating a naked tree this year with just the lights! I am SOO glad your first week at your new job has been so awesome! I hope things continue to go well for you! Oh, that chili looks delicious. Please share the recipe sometime. I am a meat eater but I love vegetarian meals and always try to incorporate several into my meal planning. Your tree looks so nice. I got lazy with my decorations since I don't celebrate Christmas in LA. I would still consider putting a tree up to get me in the holiday spirit but Max would destroy it. At best, he would just tip it over, trying to climb it (He's almost 20 lbs) and the glowing lights and dangly ornaments would just be too much. He'd do a full-on frontal assault. It's a good thing I love him. Fingers crossed that Bruno continues to do well! He's got such a good Mama! I'm so glad your first week at your new job has gone so well. I knew you'd do terrific! I hope your Mom continues to get better too! Your new Nativity looks perfect!! I'm so glad your first days at the new job have been so good!! Praise God indeed!! I love the Willow Tree Nativity and that sign looks perfect. So glad to hear Bruno's skin is doing better. Sorry you are not in the mood this year, but your tree is beautiful. I'm kinda in the mood and kinda not. I still haven't put ornaments on the tree, but I sure do love the lights! I'm also enjoying the Hallmark Christmas Movies alot. We don't go very often, but I absolutely love Waffle House. They have the best hash browns and raisin bread toast. I love the BG you're using for the willow nativity, it goes perfectly! It's nice that you guys can do black Friday together and both enjoy it! So glad all the prayers came through for your first day on the job and that you had a good time at Waffle House! Yay for mom being back home! 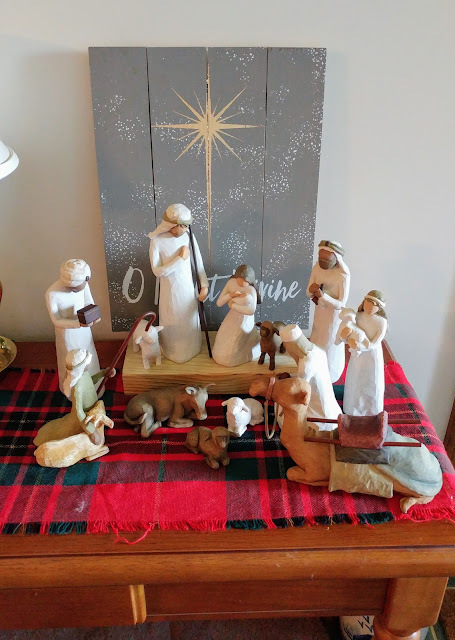 Love your tree and nativity scene! Chris just asked me last night if I was going to put out allllll the Christmas stuff this year and I told him I probably wasn't. Our living room looks too cluttered with it all and I am not fond of our current set up. Plus add in Zoe and well yeah. I think I will be lucky to just get the tree and fireplace stockings up. Well you know how this week is going, but last week was great! We enjoyed Thanksgiving with our families and a quick trip to the beach. Mike has been putting out Christmas stuff for a week now - I’m so glad he’s into it because I’m not really into it myself. Hey I got a nativity at Hobby Lobby on Friday too! :) I didn't see that sign, but I'm looking for a star to hang above mine too. Glad B is better. Have a great weekend! While I am happy your mom is home, I would be worried too. I love all the goodies you got on Black Friday! I really hope Bruno's skin continues to do well! Have a great weekend! I'm not feeling the holidays this year, either. At least I have my daughter's birthday to distract me from the blah. 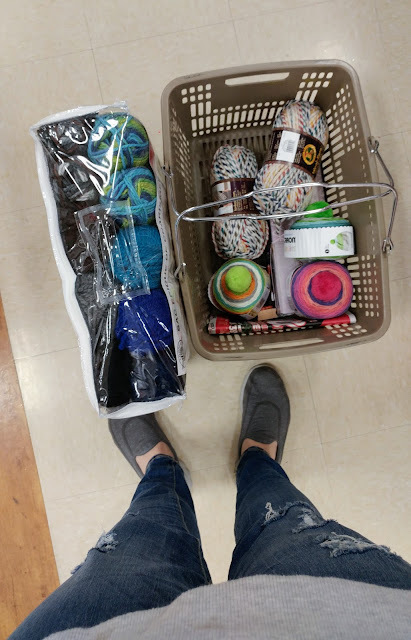 I can't do Black Friday in actual stores. People make me insane. With all the pictures of your new puppy, I was really concerned about Bruno!! I had to come here to see how he was doing. Glad he's still around, whew! For me, I'm glad Beth got to see Nick again after a couple weeks; I'm preparing for a weeks vacation in Cabo San Lucas next week; we decided to fly our youngest daughter home for Christmas! So much to be thankful for!